I think it's fair to say that female empowerment has, in recent years, become very much a focal point in our society - and rightly so of course. After so many years of inequality, I understand completely the need to raise women up and for parents of daughters to do all that they can to ensure they are raising their children to truly believe in themselves and see themselves entirely as equals to their male counterparts. Every single day my Facebook feed is filled with images depicting words along the lines of "Strong women: May we know them, may we be them, may we raise them"...or images of little girls rocking super cute outfits bearing Beyonce's immortal song lyrics "Who runs the world? Girls!" I'm all for this...If I had a daughter myself I'm sure I'd be instilling the same message in her. 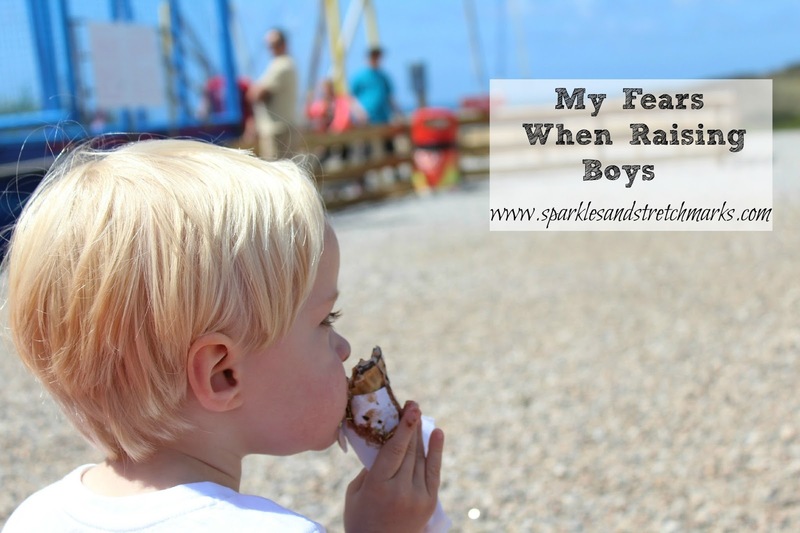 But I'm not a parent of girls, I'm a parent of boys...and recently I've been noticing more and more things that have me concerned for THEIR self perception and the message that the world they're growing up in seems to be sending to them. In our eagerness to empower the next generation of women, I fear that perhaps we're inadvertently disempowering the next generation of men. Now don't get me wrong - I'm not saying that female empowerment is having a negative impact on the grown men of the world, I'm sure that most of them fully appreciate how so many years of female oppression have lead to this need for women to rise up above it all - but for little boys growing up today, who don't have living memory of the way things used to be and perhaps therefore don't have the same understanding of it, can some of the messages we're sending be damaging to them? When browsing a book store recently for new reads for my toddler sons collection, I came across a range of books entitled "Perfect Books For...."
One of the books was called "Perfect Books for 2 Year Old Girls"...it contained lots of stories about princesses, fairies and so on...the kind of book that would no doubt anger many women due to it being so very sexist in their idea of what kind of story a girl may like! I get it...I would feel the same way if I had a daughter. But here's what I noticed...the alternate book, which featured stories of pirates, knights and battles...was simply entitled "Perfect Books For 2 Year Olds".... No mention of the word "boys" anywhere...because of course, these publishers had realised their mistake in making assumptions about what girls want to read about and were conscious not to alienate them from reading the alternate adventure stories based purely on their gender! And that's GREAT....it sends the message that girls are welcome to choose either one of the books...but also...it's not exactly very fair to the boys, is it? The girls have clear access to both of those books...whichever takes their fancy....but what about the boys? Oh no....they are clearly informed that they only have the option of the adventure book, because the other is CLEARLY labelled as for GIRLS! Is this really necessary?! Whilst I applaud the company for allowing girls to make their own choices on what to read, why is the same opportunity not afforded to the boys? Why could we not simply have had a choice of "Perfect Adventure Stories For Two Year Olds" and "Perfect Princess Stories For Two Year Olds" with no need to specify EITHER gender at all? I read something recently which, I have to admit, kind of irked me a little - it was a piece about my son's favourite thing in the entire world...The Thomas The Tank Engine franchise! The piece discussed how the Island of Sodor, on which Thomas is set, is a patriarchal society where only men are in charge, with no positive female role models - only female trucks who are to be pushed and pulled about by the male trains. Now...for a start this irritated me because it's quite untrue...living with a miniature Thomas expert I'm painfully aware of the male to female character ratio, and actually there are at least 15 strong female engines that I can name without even having to think very hard - I can see them right now grinning up at me from my sons train table! Right there amid Edward, Henry, Gordon and Victor are Emily, Rosie, Daisy and Marion to name just a few! My son doesn't notice any difference in the engines "Gender" - they all make their way onto his Christmas request lists, male or female! But what really bugged me is this...with so many TV shows focusing firmly on providing positive female role models (Doc McStuffins, Sheriff Callie, Dora The Explorer and so on) girls today are very well catered for - is it REALLY so terrible for their to be positive MALE role models around too? In our quest to empower our little girls, are we really going to completely disregard the fact that little boys still need male role models? Something other than the stereotypical superheroes and pirates? Perhaps I'm being over sensitive but I do worry that we may be so keen to build up the women of tomorrow that we end up teaching the men of tomorrow that they're not of equal worth and value...that they don't deserve the right to equality in the same way as females do, that they're somehow worth less. Basically...a future echoing the past, but with the gender roles reversed. Is this really what we want? Shouldn't we be working to make the genders truly, finally, once and for all equal? I hope I'm wrong, and I know I'll be trying my hardest to teach my sons that they can be whatever and whoever they want to be....be it Pirate or Princess...but that task is made all the more difficult when the story book and costume aisles are constantly contradicting me. Love this, you are so right and I've got 2 daughters who I hope will be strong enough to face the world when they are adults but I also want them to know girls and boys should be treated the same. My eldest started full-time school in september and she already comes home with statements about how the boys play differently to the girls! I think there is a clear difference between the two genders that we cannot hide but we need to embrace them and make sure all the opportunities are available to them whether they want to be "fairies' or "pirates". I was literally just talking about this to my friend who has a girl! It's so eerie, literally just talking about it and I feel the exact same way! i have a girl and I can see where your coming from. What I just saw was people talking about a toy called girls adventure and asking why its pink and called girls adventure and only for girls. I argued saying well the characters are girls and there going on a adventure. I don't think the company means that it's for girls only. BUT your right... There is no pack called Boys adventure, with the characters being boys. I think your right with what your saying about being to much Women ruling the world talk and I hope to have a boy one day to and wouldn't want him growing up thinking than he is any less than a women, we would be slap back to how it used to be but the opposite way around. I have heard stories of men saying to women asking for help from them no , because apparently women can do it all themselfs. Not always true! I can't carru heavy things and I think men and starting to think they don't need to help us anymore when sometimes they do! I have a 1 year old boy and have given him elsa and Anna dolls. We read princess stories as well as pirate stories. I think the problem is much deeper than companies not wishing to offend girls. When my father in law saw my son in his pram holding tightly to his elsa doll...that sings (why did I buy a noisy one 😩) he immediately went out and bought him a noisy truck and proceeded to swap his favourite doll for the shiny, new truck and told him he doesn't need a doll. I obviously said thank you for the toy, took it away to save for later (he has soooo many toys anyway) and gave back his doll. Really interesting point and I do agree. Yes there's still a way to go for girls to be seen as totally equal by a lot of businesses and people. But boys still need to know that they should strive to be the best, and know that they're not being negatively impacted because of people allowing for girls if things move towards quotas and allowances rather than based on merit. In N's year there are 17 boys and only 3 girls, so I don't think he'll have an issue, but I'd hope that he'll still be able to learn (he's also only got 1 girl cousin vs 5 boy ones) that girls need to be listened to, respected and just as good as boys. As a mum of 2 boys I completely agree with this. Brilliant post.